November 2009 – just sorting through older Bh material. I feel that this is probably more important now than ever before as Barbara is now starting to articulate her ‘green studio’ manifesto . . . and as she decided to stay ‘local in her community’ all those years ago, to concentrate on making objects and tokens that carry sentiment, meaning and mark the important occasions in people’s lives. Her early articulation of the ‘commission’ as her primary interest and service is now virtually a mainstream activity, having been taken up by educators – jewellery students, historians and curators. 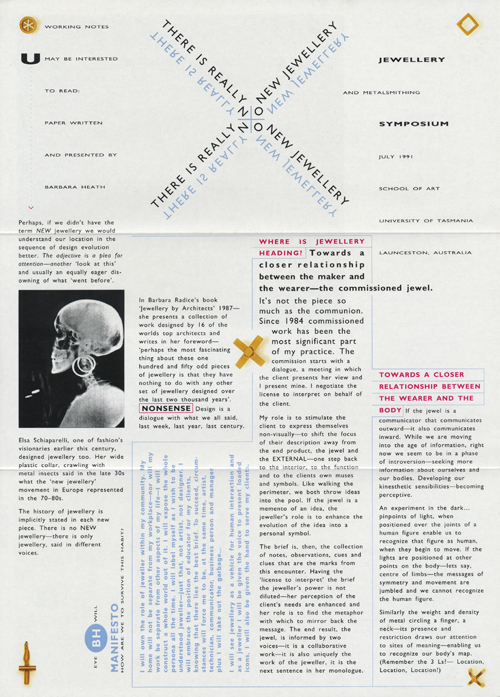 So here is the front side of the mailer as a downloadable .pdf The graphic design shows where I was typography-wise at the time, it is interesting to revisit this important positioning document and to read where Barbara’s mind and interests lay also, back in 1991.
any ideas how i can do this on a large scale. 3m long tubes primarilyhow does it wear with handling?